so when I saw the same one at a local thrift store for $15, I gasped. And thought about where I could use it in our new house. The entryway! I already knew it would look great with a coat of paint because I had seen the finished product. How often does that happen?? But guess what I didn’t take into consideration?? Our entryway only has 9 ft ceilings and so anyone close to 6 ft tall would bonk their heads on it. Arrrrgggghhhh. I was so sad. So there it sits and I need to come up with something else PRONTO. 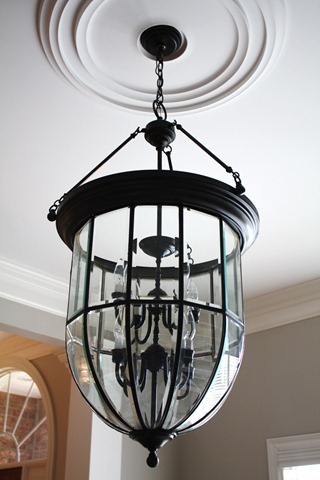 The other light fixtures are already hung on the higher ceilings…if anyone local is interested in it, email me! I want to see it go to a good home. gone! This one was going in the pantry, but I may need to paint it and make it work here. Good rule to live by: measure before you spend 3 hours taping a light fixture off and painting it. I’ll share some of my favorite entryway light options tomorrow that I also considered, but my lighting budget is depleted, so we’re going to make something else work. The pantry light is pretty too! Light has already been spoken for, sorry. Oh I have done that too! No high ceilings in our house. Makes me sad. Light is gone -- thanks, everyone! Your new home looks so beautiful! I love the paneling too? Is it real wood? I'm looking for paneling for my walls and it seems like the stuff at big box stores is so rough. Any tips? :) thanks! I actually love the pantry light every bit as much as the other one--it will look great! LOVING the sneak peek at your new house...can't wait to see the rest of it! Your entry way looks great! I love the front door, side lights and the French doors. Good luck on the lighting situation.